The first notes we hear are slow, thoughtful and delicately placed, guitarist John Abercrombie and pianist Marc Copland in a careful dance with each other. The cymbal decoration from drummer Joey Baron is similarly light and spacious, the notes from double bassist Drew Gress serving simply as low markers along the path. The tune is called Joy and it is just that. As with this band’s first album, 39 Steps (ECM 374 2710 - REVIEWED) Copland gets two compositions and there is a standard (Miles’s Nardis this time), but most of the writing is the leader’s, and if you liked that album you will probably like this one even more. The continuum is one of a deepening and so less tangible interaction between four master musicians and with the music. Abercrombie has said: “…we like to play the form but keep it a bit open, do something with it. There’s an elastic quality to this band’s playing, nothing is ever too on-the-nose – and that’s the way I’ve always liked things.” Flipside and the title track offer a quicker dance, and in the latter I thought I could hear some Kenny Wheeler influence both in Copland’s melodic line and in the general attitude to the music - yep, “never too on-the-nose” sums it up. 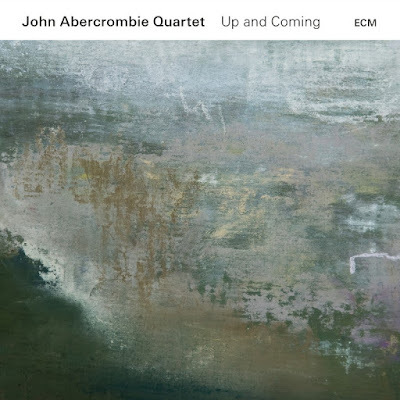 Those who like Abercrombie’s wider emotional range on his albums of 20 years ago might find his more recent work a little too consistently mellow. To my ears the range might be restricted but the subtlety within these more constrained boundaries more than compensates. There is a compelling groove on Copland’s Silver Circle which illustrates just how funky this band can still get while still maintaining the meditative aspects to the music. Their mutual support systems are second to none. Catchy tune too. For those who don’t know the band, Nardis is a fine place to start. It shows both the band’s way of working and how loose they can get without in any way losing the plot. As an album Up And Coming is an understated gem with a subtle glow that shines deep.